Pursuit of Peace: Let's Drop A Love Bomb! Hey guys, got a few minutes to improve the life of one person today? I bet you do. Let's do this together. Love Bomb Mission: Rachel, 17. Loss of dad, eating disorders and depression. Note: We are now partnering with bloggers for missions! This week's partners: StarbucksBreak.com,YoursTrulyTrayce.com , LoveChelseaLauren, ProneToWander, TheBeesKnees, Collection-Of-Things,PostWithTheMost, InspiredMess, TrueConfessionsOfASingleMother, MrsMuffins, TallAsGrass, DoGoodMore,BelleChantelle, DevilishDelish, BuckOwensGuitar, ABCCreativity, BriannaPoster, AmySoto.blogspot.com, and LaurenNicoleLove. We are dropping today's Love Bomb on a 17 year old girl named Rachel. She lost her dad and ever since has dealt with eating disorders, and is struggling through life without him. Her mom avoids serious conversations with her and she is afraid to get help. She's in counseling, which is wonderful - but we all know how irreplaceable personal words of encouragement are. - I keep relapsing into "disordered eating behaviours"
"What I need is some inspiration. I need someone I admire to tell me every thing's going to be alright. That they believe in me. That I'm not the fat failure I think I am. - unfortunately I can't see that happening any time before it's too late, if it's not already too late." Alright guys. You know what to do. We ARE Rachel's inspiration, encouragement, love, and support. It's time to tell her how beautiful and valuable she is. I want to blow her away. 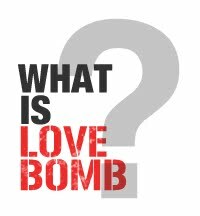 Time to drop a Love Bomb, friends!